You can’t deny that being a teacher comes with it’s own kind of stress. Teaching is a profession that can leave us crying both from laughter and from happiness all in the same day (hour? lesson?). Being a teacher takes a special kind of person, that’s for sure! Teachers give and give of themselves but don’t often stop to make sure they are taking care of their own needs too. Thank goodness for summers! Not that summers are completely free time for teachers (raise your hand if you plan on doing Professional Development this summer! 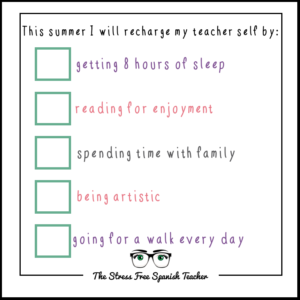 ), but they are the time of year when we do get to do some of the things we neglect to do during the school year (I mean, besides being able to go to the BATHROOM whenever we need to..!). You can see some of the things I’ve put on my list above. I’d love to know what’s on your Summer – Self – Nurture list! 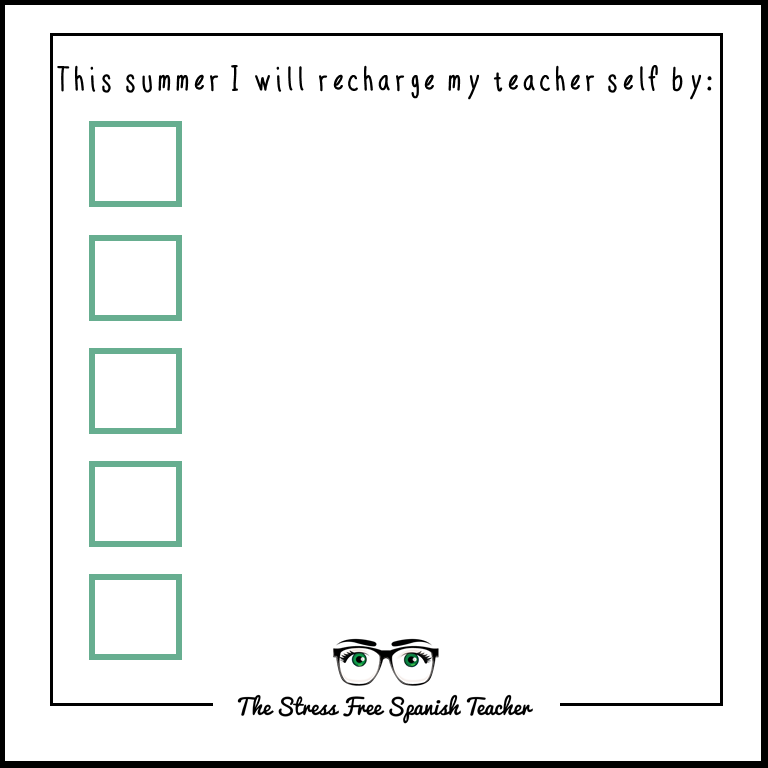 Use the image below and add your own Summer “to do” list. 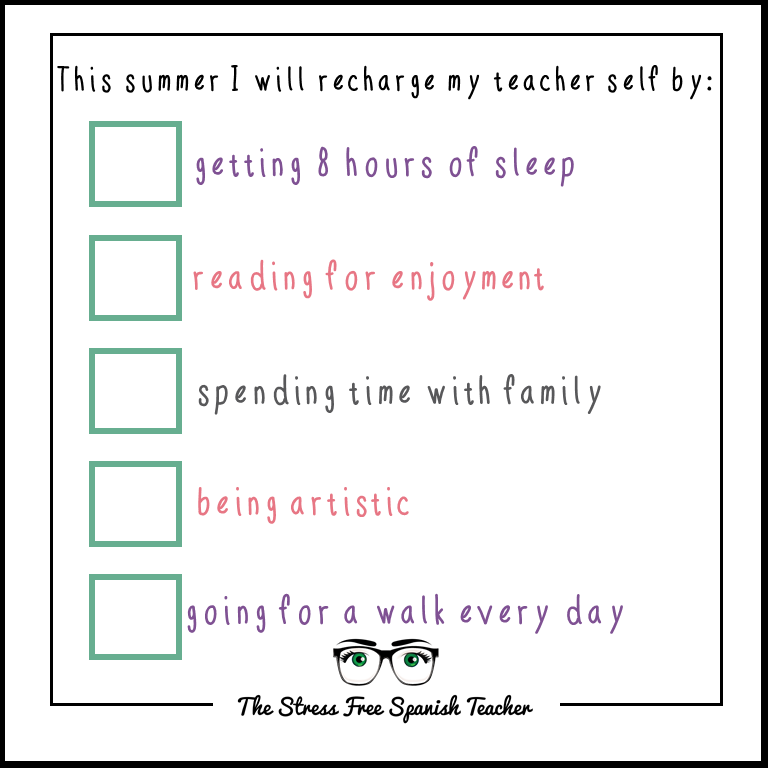 Please share on social media and tag me @thestressfreespanishteacher because I want to cheer you on in taking some time for yourself this summer! And I love getting to know my fellow teachers. SCOLT conference 2018! Time to say “Adios” to the old FB page!